June | 2015 | cut it out, stitch it up! I really fell for this Marc Jacobs skirt when I saw it in the Sunday Times Style magazine a few weeks back so I thought I’d have a go at my own version. I have to say I am pretty pleased at how it has turned out. 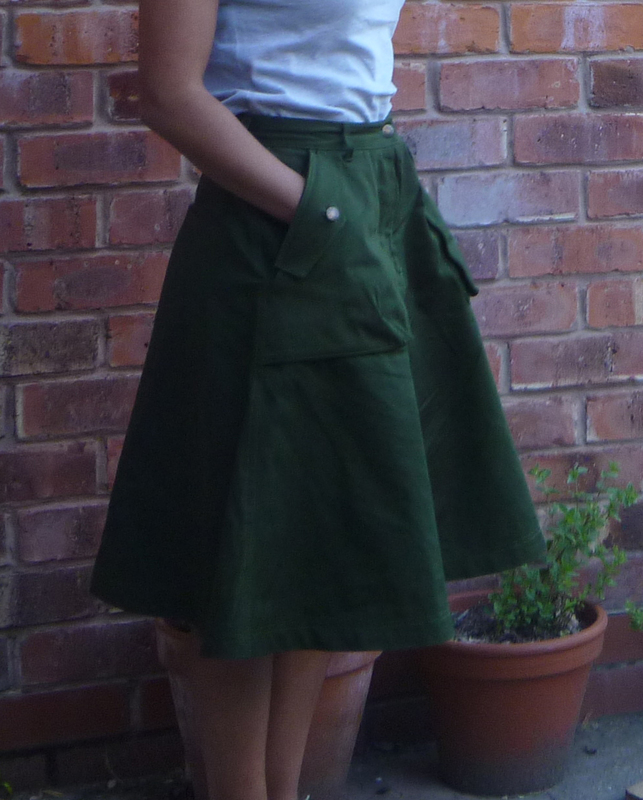 My skirt doesn’t quite have the same proportions, mainly due to my mistake of not ordering enough fabric. I though 1.2mt would be OK but I underestimated how wide the panels were. I spent nearly a whole evening just looking at the pattern on the fabric and trying to work out the best thing to do! But I got there in the end. I was searching for just the right colour green in cotton drill but couldn’t find it so I bought white from myfabrics and use a Dylon machine dye in olive. (I like the way the dye now includes salt). I think I got closer to what I wanted than buying ‘Moss’ or ‘Forest’ but not sure it was worth the extra cost of the dye. 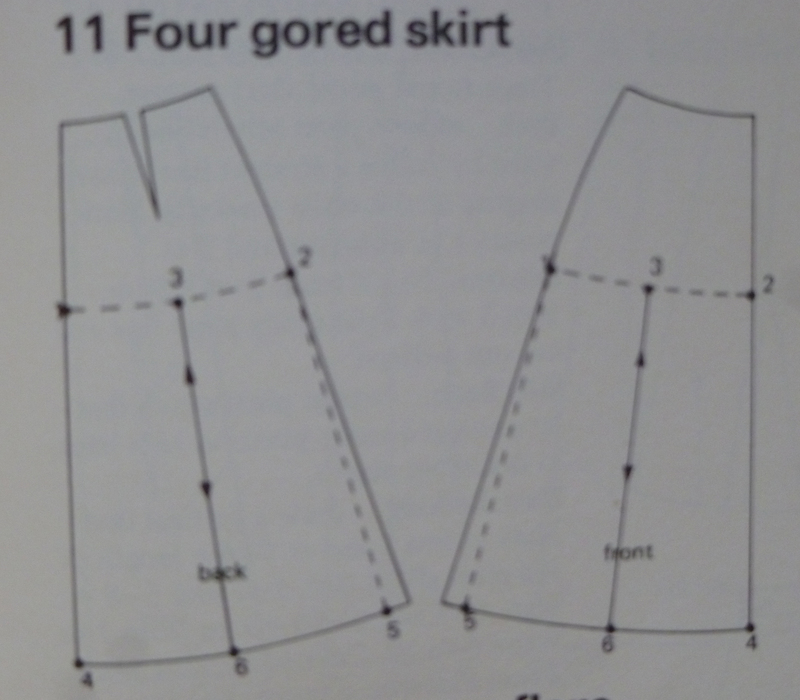 The pattern is quite simple, drafted from the Winifred Aldrich skirt block. The darts are closed to add flare. After making a toile I needed to cut up the middle of the panel and add in 8cm at the hem for extra width. The grainline is placed up the centre of the panel and not the centre front or back. This improves the drape. When wrestling with the pattern layout this was one thing I didn’t want to compromise. For the bellowed pocket I used a piece of A4 paper and pinched a dart in the corner to get the desired effect. I then laid this onto the skirt pattern to get the shaping of the side seam and waist. 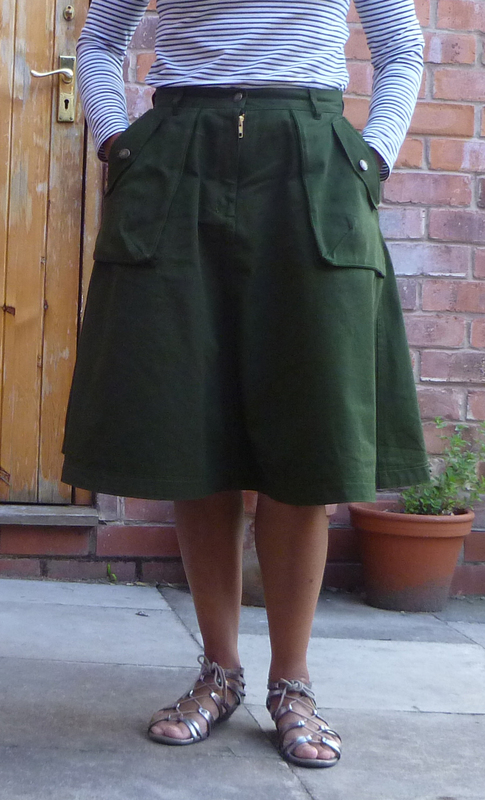 You have two pockets at the side seam, one for your hands and one with a flap. I made up the construction of these as I went along. The hand pocket is constructed with a front and back pocket bag then the bellowed pocket was added to the top. I was trying to think of a way not having to use as many layers. 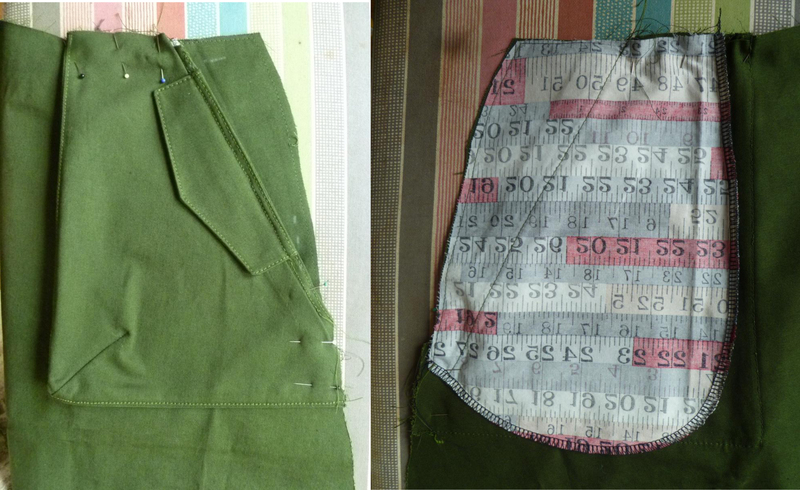 It wasn’t until after I’d finished the pocket I thought that what I could do is make the hand pocket back smaller than the bellow pocket and stitch just one layer to the skirt, the stitching on the front of the skirt would then be hidden by the bellow pocket. I would say that the fly zipper was the best so far! The only problem is with the size of the zip puller. It wasn’t until I’d finished that I realized it’s a big bit and sticks out. I bought this zip which is 15cm and a 13cm one at the same time, the 13cm zipper puller is much smaller. 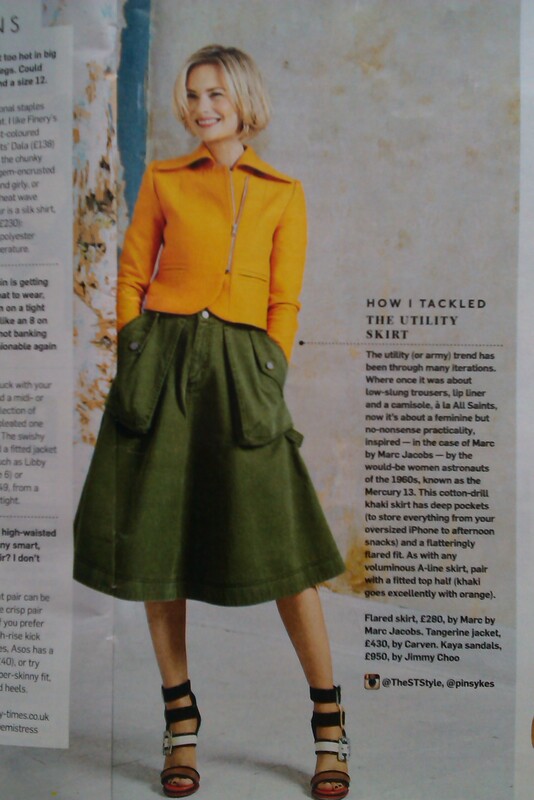 It does annoy me a bit and it’s the first thing I see when I look at the skirt! 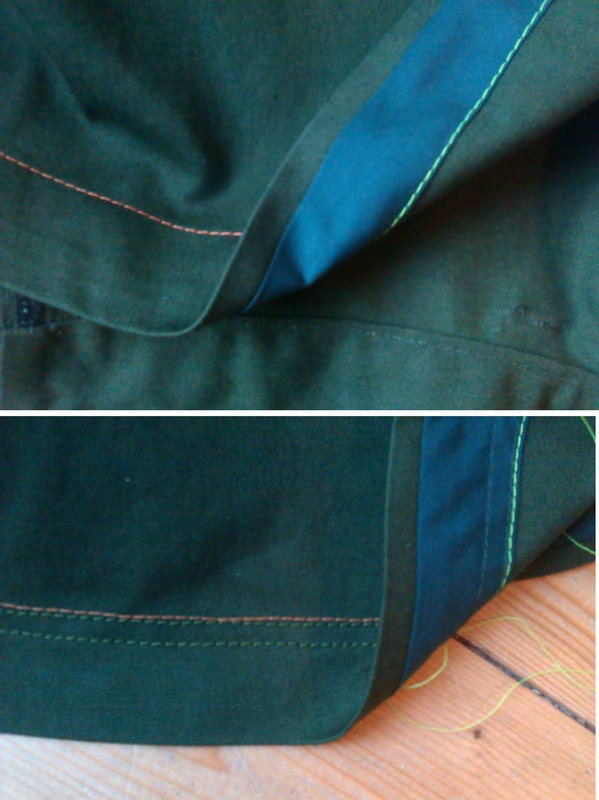 The hem is finished with a wide bias bind tape. I had originally planned to use self fabric facing. When I cut out I left an amount which I thought would do but then I realized that there wasn’t enough for the waist band and hem facings. 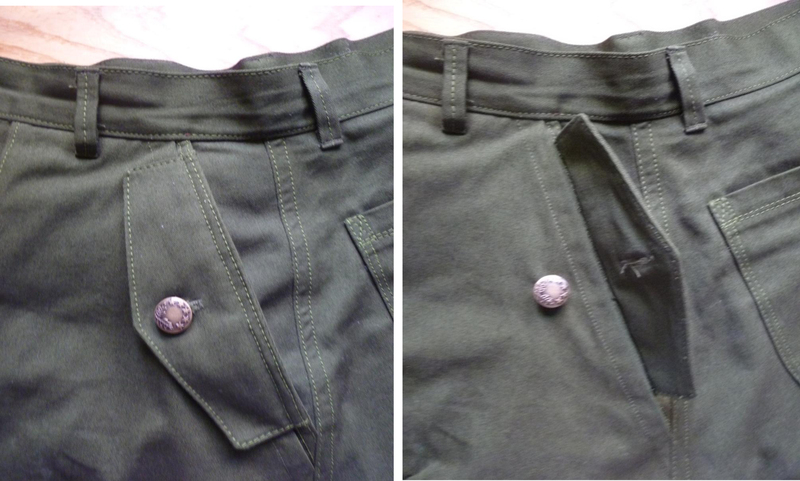 The waistband was more important – and that still needed a seam in the centre back to get a piece long enough. Using the bias tape worked really well, I slightly stretched on so the smaller top edge fitted with out any tucks etc. I had to top stitch from the front for the hem so to make sure I didn’t miss the fabric underneath I stitched first on the wrong side using contrast thread and the biggest stitch. Then just pulled out the contrast thread when I had stitched the two rows of hem stitching. I top stitched using the Gutterman extra strong thread rather than the topstitch thread. I find this works for me better and gives a similar look. It’s not all plain sailing as there was the usual tangling up of bobbin thread I always experience with topstitching. This is now my new favorite skirt. I really love the shape of how the cotton drill hangs. I can see me making another version but next time I’ll buy more fabric as I think a little extra width could be added to the panels and I think the pocket bags could do with another couple of inches in depth. I did also pick up a remnant of tangerine cotton jersey with plans to make a tee, I’m not quite 100% sure about this yet, I’m just worried it’s too bright. I don’t think there’ll be any more sewing in June as I’m off on a work trip from Monday. I’ve got a long flight so I’m planning to finish a pair of socks that I started back in February. I’m 1/3 the way through sock number two but it’s slow going……. Back at the end of April I signed up for Me Made May ’15. Because I wear my own makes most days I signed up to wearing 2 pieces of Me Made each day. I got through the month sticking to my pledge but with a lot of repetition and the jeans were the most worn item easily by far! I do tend to repeat as I try to keep the amount of laundry down – if it’s not dirty, wear it the next day. 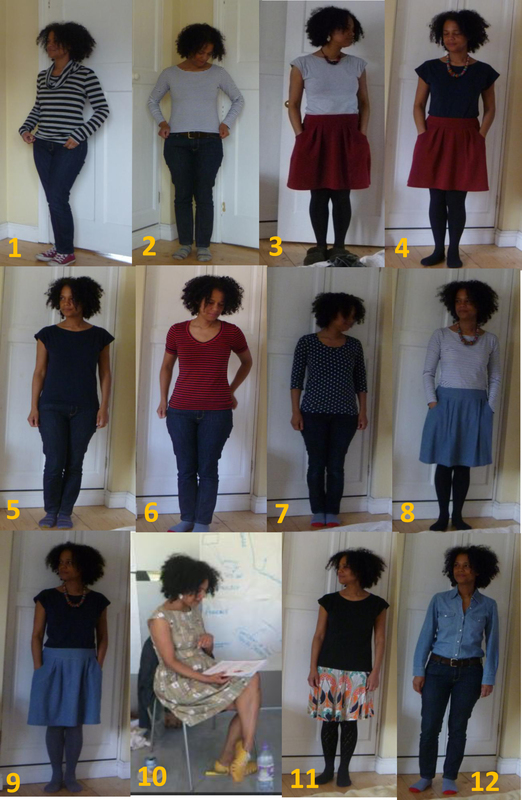 I wore 12 different outfits throughout the 31 days. Most of May in my part of the UK was cold and rainy with the exception of one day when I had to travel down from Manchester to London with work. That’s when I wore the Lucienne Day print dress and had bare legs. I attended a course and the photo is taken from a video still. Looking at the pictures it’s made me think about what I wear. I’m beginning to think it’s all a bit boring. I only wore a dress once which is disappointing – but then the weather wasn’t good enough to be wearing the summer dresses that I’ve made. On some of the days at work I do make the effort and put a skirt on but days at home do tend to be jeans and a jersey top. I’m running around after 2 young children so I find it’s a practical outfit. Most of the photos were taken first thing in the morning so that’s why I look like I’ve been dragged through a hedge backwards! Well done to everyone who took part and I’ve enjoyed reading the posts. 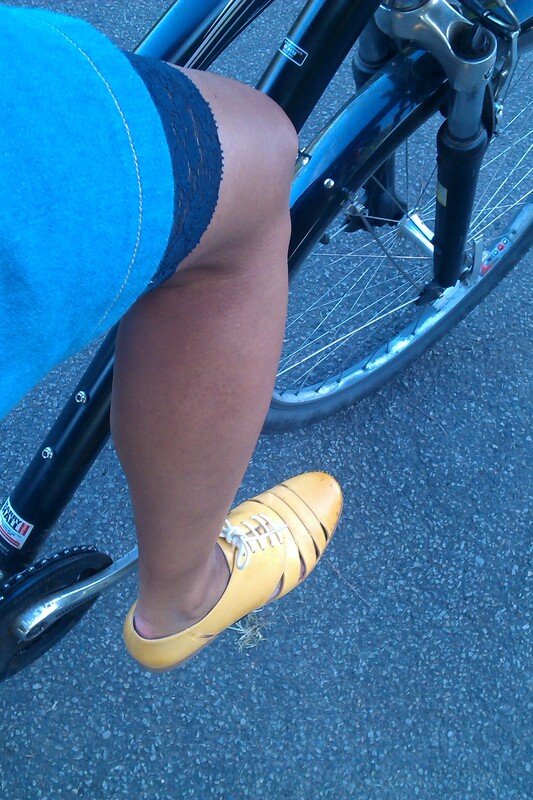 Now we are into June the sun finally shone yesterday and I was able to wear my bike bloomers for the first time. I’ve realised it’s not just the skirt riding up at the front it’s what going on at the back of your thighs, the bit you can’t see but everybody else can. The bloomers did their job and protected my modesty.